This week I'm obsessed with... Avon Anew Ultimate Gold Peel-Off Mask! Ever had the urge to channel Bond Girl, Jill Masterson, with all that shiny, golden skin (but less dead)?! 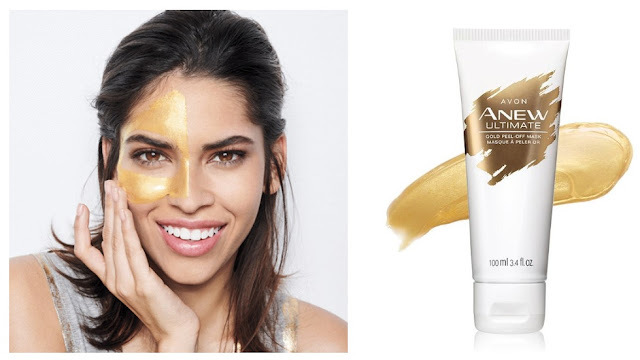 Avon Anew Ultimate Gold Peel-Off Mask - 100ml - $39 - with vitamin B3 and botanical extracts known to reduce the look of age spots while lifting, tightening and soothing skin. It's easy to use - just apply a thin, even layer over cleansed face and leave on until dry (about 15 minutes) - spend that time strolling around the house amazing family members and scaring pets. Then gently peel off - extra points if you can peel off all in one piece - and rise with warm water - now admire the glow! Available now from your Avon rep - 1-800-265-AVON or online at avon.ca.